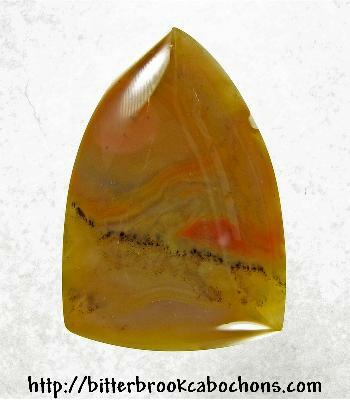 This Picture Jasper cabochon is cut in a shield shape and looks like a hazy sunrise over a hillside. And it has a cousin, too! Click here to see the relative. 39.5mm x 27mm x 6.5mm. Weight: 56.25 carats. Do you like Picture Jasper Cabochons? Click here to see all of the Picture Jasper Cabochons on the site!